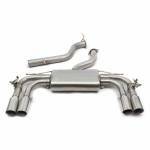 The Cobra Sport range consists of cat back systems, rear boxes, manifolds, sports cats and catalytic converters for a huge range of vehicles with a vast choice tailpipe designs. With proven power gains and unique styling, Cobra Sport performance exhausts are a favourite amongst serious car enthusiasts in the UK. Tailor made for your car, Cobra Sport Exhausts need to be fitted in a professional workshop. Most of our Outlets will be able to offer a fitting service for this product - please contact your local Outlet to find out more.